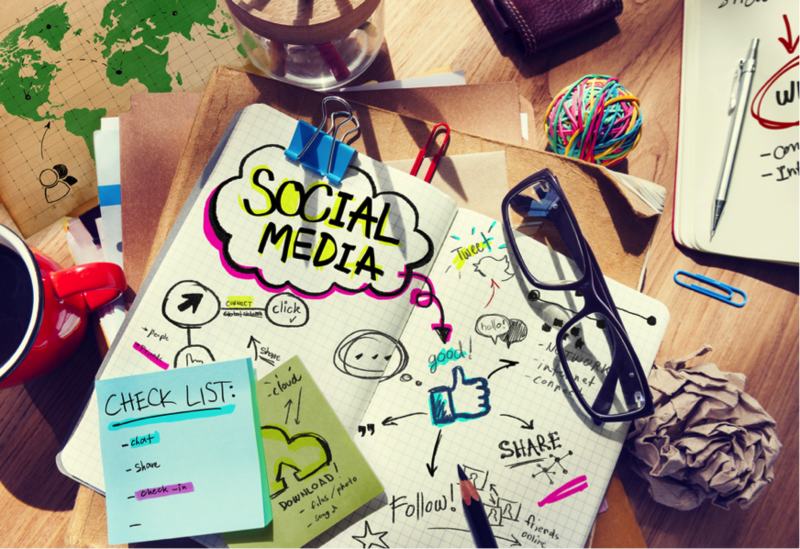 Are you stuck with your social media? Not sure what works and what doesn’t? We created this free guide so your Montreal-based small business gets a head start to succeed on social media! Social media has grown to become an essential element of our society’s communication, bringing together people from all over the world.Social media sites originated as a way for people to connect but the major sites, like Twitter and Facebook have developed into powerful mediums where people and business can communicate. Social media offers multiple marketing to businesses, giving them a unique way to reach their potential customers, regardless of where they are geographically. Social media sites like Facebook offer huge potential for small businesses to kick off their marketing campaigns, grow their fan base, connect with their audience and create brands that customers remain loyal to. 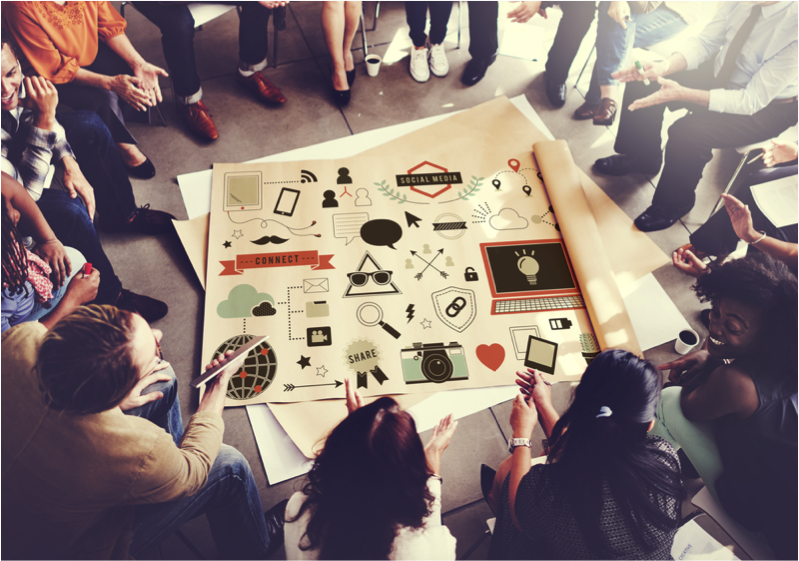 Successful social media marketing efforts require more than just managing a page. To achieve massive results, you must establish and carry out a well-thought out strategy. When you are finished with this guide, you will understand how to design a social media plan that will grow your audience, encourage interactions and increase business growth in a unique and impressive way. Developed to provide your Montreal business with a better way to attract customers, get in touch with your target audience and create compelling content, you will discover how to have a sgnificant presence. This guide is a thorough plan for new local businesses in and around Montreal and with it, you will learn the best methods for your social media marketing, guiding youas you create your ideal audience, differentiate yourself from your competition and create a local presence. No matter what you want to achieve on social media, you can develop the best campaign for your business by deciding important factors like audience features and advertising techniques. If you have a social media strategy that you don’t feel is successful or if you are just starting out, this checklist will give you actionable steps so that you can utilize all of the tools social media provides. To get started with your marketing, you must learn who you want in your market. There’s no perfect audience out there. Your products, your geographic location and your local area will have an effect on your ideal target market. Focusing on the local Montreal area will help you but you can determine how local and targeted you want to be and your audience specifics. Your business’s target market will be determined by several components, including how you provide and deliver your products and services. If you are primarily an online retailer who ships your products outside of Montreal, your targeted location will be broader than anyone with an individual storefront.Assess where your buyers come from and aim to focus on the specific places that you know you can reach people who will buy from you. It’s unimportant if an Ottawa resident is visiting Montreal; you do not want to waste time targeting someone who is not local. Determine who is a consistent buyer of your products and services. If you are unsure who are your regular buyers, you need to begin to track these statistics and determine your ideal market. For example, let’s say you sell baby clothes and accessories, your audience is probably an older market, especially parents. Perhaps a teen will stop in every once and a while but focusing on parents will help you to narrow your market. With unique advertising capabilities, Facebook gives you many ways to discover and identify your target audience. You can be as extensive or precise with your targeting, but remember to focus on your investment and your return on investment. Widening your search to anyone within 500 miles of Montreal may give you the impression that you have wider audience but you may not see the same increase in sales that you are see in your costs, especially if you only have one physical location. Remember who are the people who will be most likely to buy from you or be interested in what you have to sell. If you sell ties, you do not want to spend advertising dollars on women, except during the holiday season. Also keep age ranges in mind. Children are not interested in life insurance and adults will not be likely to interact with ads for local arcades. No rule is hard and fast for excluding segments because it’s always possible someone does not fit in traditional audiences but being specific with your target market will increase your chances of finding the most likely customers. There are multiple ways to target an audience using Facebook ads. In your Ad Manager account, you will see different options to choose from for your target audience including, age range, gender, kilometer distance from, exact location or language. On the right side of the screen, Facebook will give you a look at if your targeted audience is too broad or specific or just defined enough to give you results. As you make your choices, the insights will show you how your audience is defined. If your targeting is too vast, like everyone in Montreal under the age of 65, you may not stand out with your audience. If your targeting is too focused, like focusing only on 18-year-old women who live within 10 miles of you, you could miss out on potential customers. To choose your audience,you can log into your Facebook power editor, choose your advertising account, then choose Audiences on the top tab. Once there, you will click the Create Audience tab, and choose from “Create Saved Audience” from the drop down menu. After you choose that, you can create your audience based on location, which is the city of Montreal and the surrounding areas. 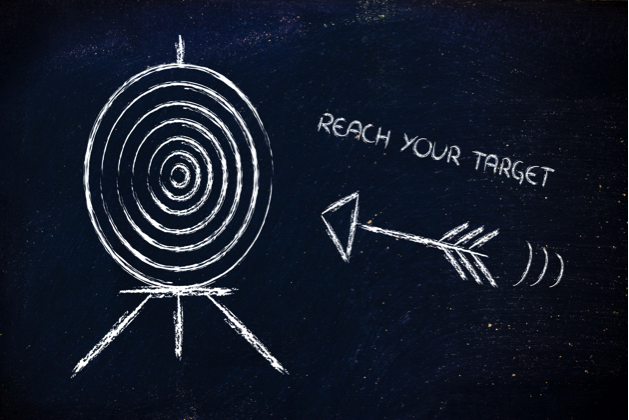 Now we will look at defining your search with more advanced targeting. 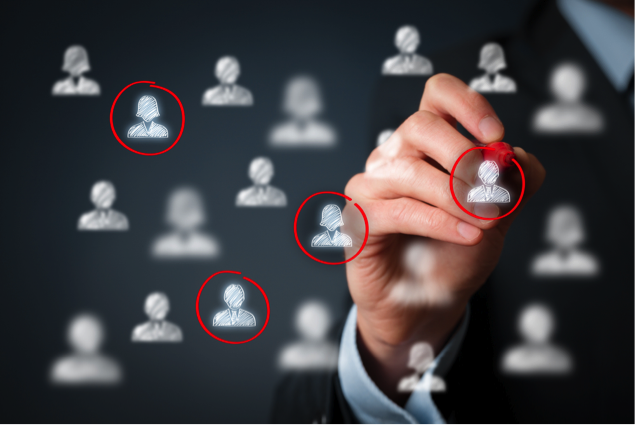 Finding the right audience is more than identifying their geographic location. It would be incredible if everyone located in and around Montreal was your ideal audience but it’s unlikely. If you want to create an ad that translates into more customers, you need to identify and target individuals who are likely to buy from you. Facebook offers more targeting options than gender, age and location. You can target using page likes and more advanced demographics to get even more precise look at your target market. This is not always a foolproof way to find your perfect customers because many people on Facebook do not follow their favorite sports teams or hobbies but it can effectively tighten your targeting so you improve your odds at finding the right users. There are some industries and services that are best targeted to a specific profession, such as medical supplies targeting doctors or hospital workers. Utilizing this targeting feature, you know that the correct audience is being marketed to and reached. It’s always a possibility that a custom will come from an unforeseen area but it’s best not to expect for your audience to come from anywhere and everywhere. Pick behaviors that match your target market and you will have a great opportunity of seeing return from your advertising campaign. Personal interests is an excellent way to reach your ideal audience with your advertising. Let’s give an example; if you sell or can also go a long way in identifying the most likely targets for your ad campaigns. For example, if you sell women’s clothing and accessories, you will be able to narrow down your audience by choosing people who are interested in dresses, handbags and jewelry. This allows you to save decrease your costs by being specific with who sees your ads. Their is no point to use your advertising dollars on a user who will not shop for your products or services. If you are unclear how you should define your market further, assess the similarities between your products and other interests. If you’re not sure how to narrow down your options, think critically about parallels between your business and common interests. For example, using our example from above, if you sell women’s clothing, you may want to target users who like specific brands that you carry in your store. Experiment with your interests or only choose one or two. The success of a specific interest will be influenced by your business. Enter a particular interest that aligns with your customers interests. See below for an example. 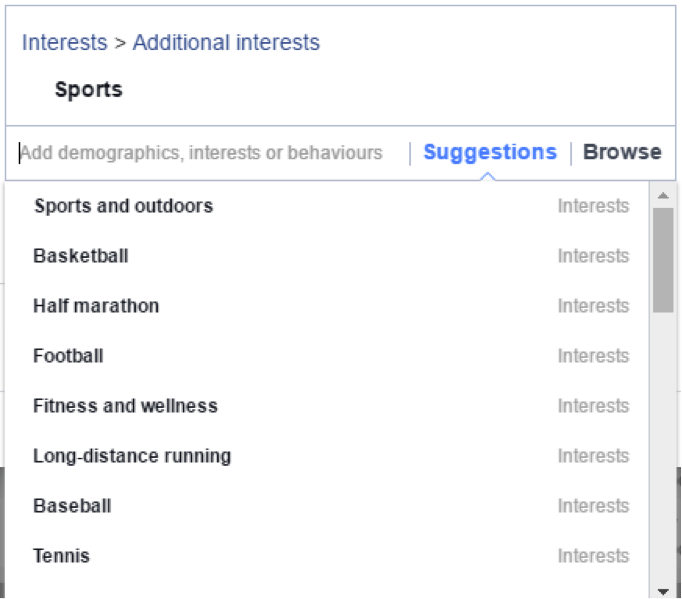 Then Facebook will show you other interests similar to the original topic you searched to further define your search. Or you can click browse to see major categories Facebook offers. The exclude function is another beneficial tool which enables you to target a large audience and exclude segments within that audience that are not useful to you. In the example below, we are targeting anyone that likes sports, but without the people that like Basketball. 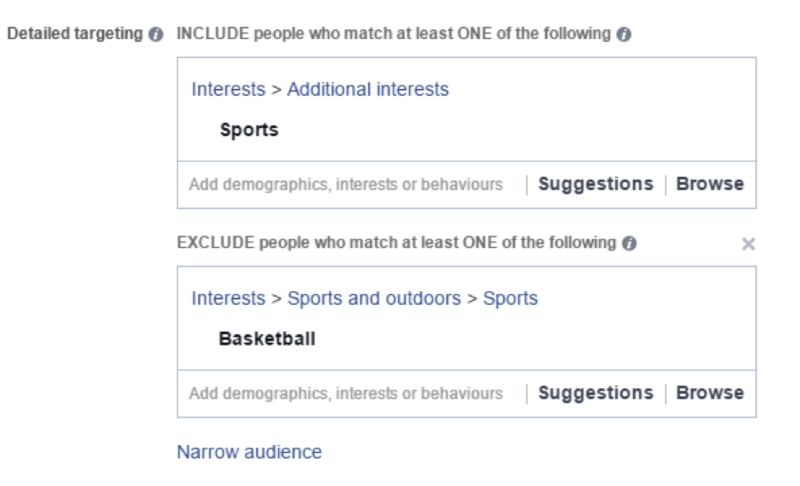 You can find many combinations of targeting interests when you use the exclude function to help find your audience, which helps your ad be more relevant. 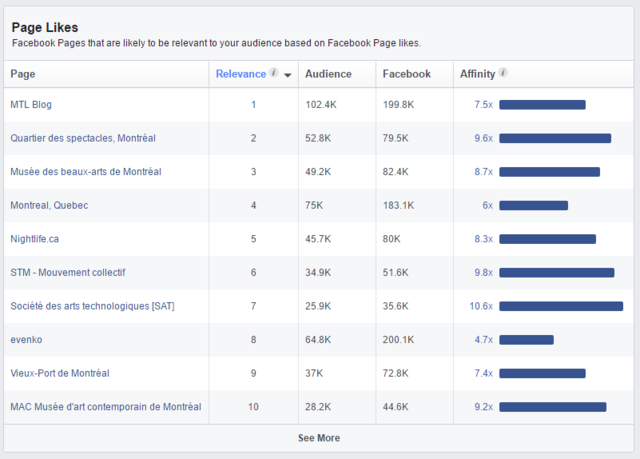 You have now identified that your audience is Montreal and you know their ages, gender, interests and and professions. Now what do you do? Now, you figure out what you will say to your audience. 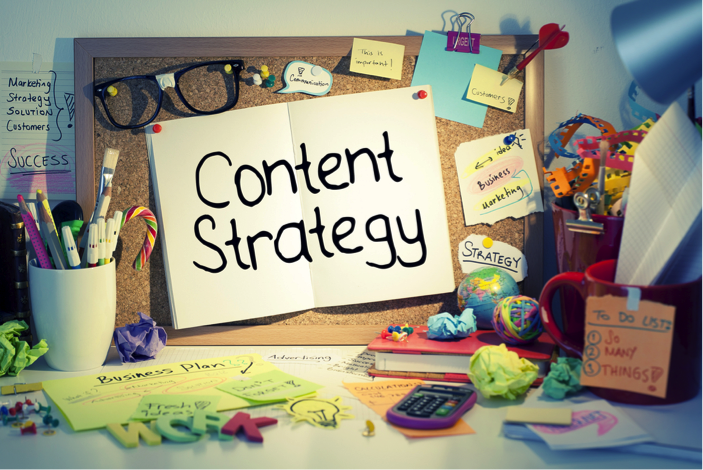 When creatingcompelling content, it’s necessary for you to relate to your audience and also highlight the benefits of your product or service. Your fans may love Italian food but not everyone within your targeting will want to see Italian recipes. With this piece of information, you can begin to start producing content by focusing on other areas or things your audience likes. If you know what pages, brands, activities your market is most interested in, you can adapt your content with that in mind, customizing your promotionsand campaigns. 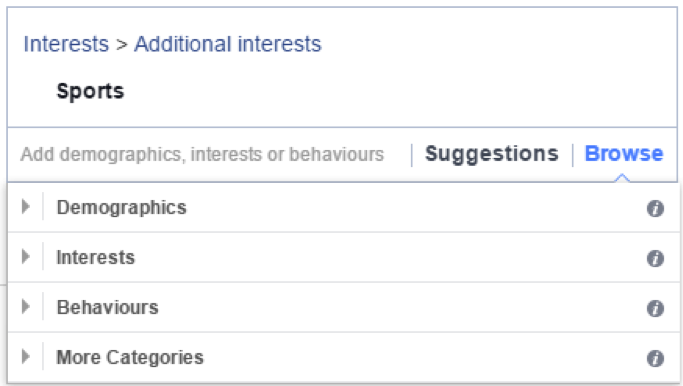 The Audience Insights feature on Facebook, is an excellent tool for finding out these interests. You can find the Audience Insight feature under the tools drop down in your advertising account. With this tool, you will find data on the topics and pages that people in your region follow, talk about and like. With the Audience Insights feature, you can type in the factors you already know like the location, age, gender, interests and pages and the tool will show you similar pages, locations or activities that your targeted audience is interested in. You can put mix and match with this tool to see where interests intersect and where your targeting is too specific. Audience Insights will give you demographic insights, as well as, the most popular pages liked by your targeted audience. 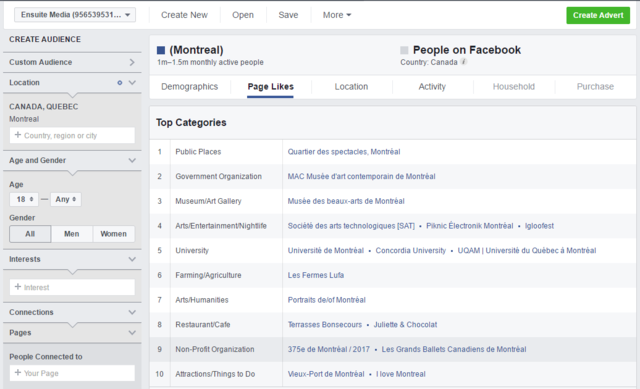 In the example above, adults of any gender in Ottawa are a market of roughly 1 000 000 to 1 500 000 Facebook users and within those users, la Société des arts technologiques, la Société de transport de Montréal (STM), le Quartier des spectacles, and Nightlife.ca are mutually liked by the most people. This is extremely important information because it will serve you with insights on the services and topics that will attract eyes to your ads. You can’t win the race if you don’t know how fast your competitors are. Montreal has hundreds of small businesses and regional offices for larger businesses who could possibly have customers who could be in your ideal market. Being aware of the local market, who is in the market and what they are doing to attract customers is extremely beneficial to you. other companies are marketing, what promotions others are offering, which means competitive research is an excellent use of your time. In this day and age, competitive research does not mean going door to door to see who else is in the area. There are many tools and resources Montreal businesses can utilize to learn more about the local market through local directories so you can see who is competing for your customers. 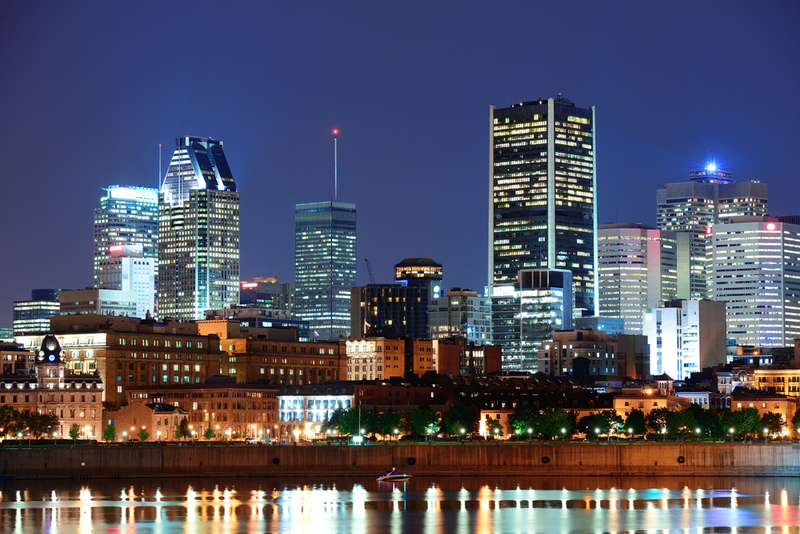 The Montreal Business Directory is a comprehensive database of local companies in the area. is an excellent database, listing the local companies doing business in the greater area. You can search by keyword or by category to quickly locate and find out more information on other local businesses. 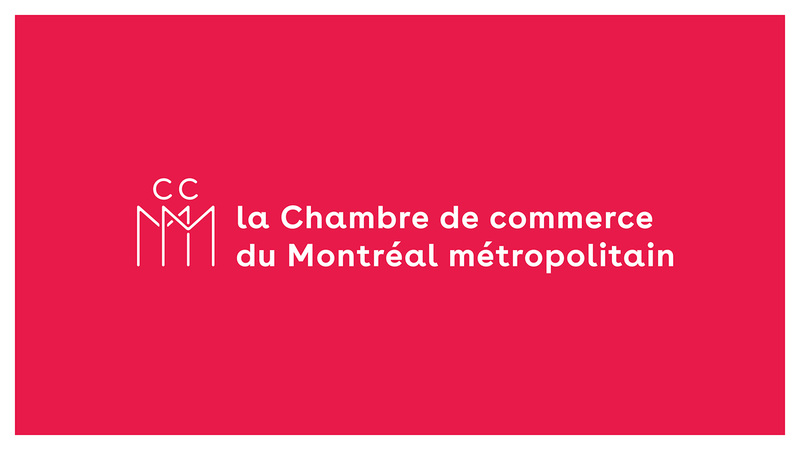 The Montreal chamber of commerce of Montreal is also a great source of information. Yellowpages is another excellent tool that gives you with many options to search for local businesses. You can search by location, niche, business information or by popular categories, finding any and all businesses near you. 411.ca in Montreal also allows you to search by business name, city, or category with full information on businesses in the Montreal area. 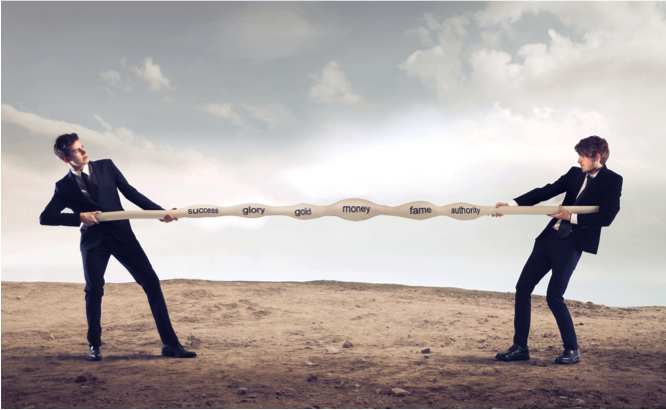 Knowing your competition allows you to get a step ahead of them. You never want to replicate what someone else is doing but understanding what is successful in your market will give you ideas on how to get started. 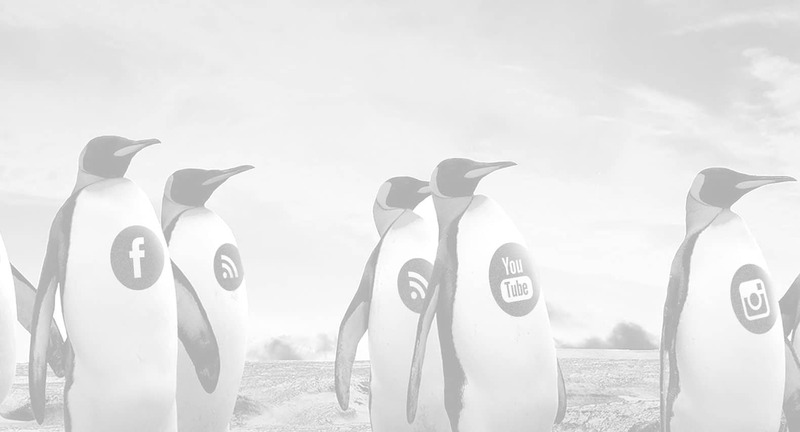 For example, if one of your major competitors is constantly posting videos that are being shared by their fans and going viral, you know that videos could be engaging content for your followers. On the other side of the spectrum, my monitoring the competition, you can see where there is space to be filled. If one area is crowded, go the unknown road and distinguish yourself as a thought leader. This is when your own research on your ideal audience and your own business comes in handy because if you don’t know your business, you can’t use your competitor’s weakness and strengths against them. Your surrounding area and neighborhood is going to be very important to you as a local business. Your most consistent clients are probably citizens and community members who frequent your area of town so local events should be extremely important to you. Staying in the know with Montreal’s events and news will impact your success in the area, considering local events or interacting with local organizations can help you put a person and personality behind your business. By being an active member of the community, you can help you stand out with the local market. When you are aware of everything happening in your area, you can plan your marketing accordingly. Creating content around local events is an excellent way to connect with your audience and sharing your love of Montreal. 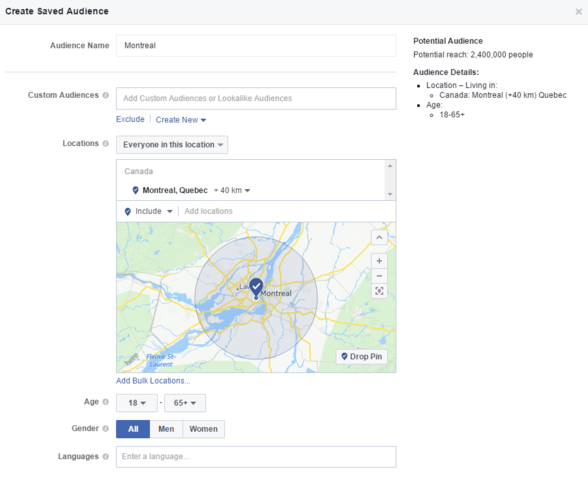 You can create marketing or advertising campaigns, sponsor events, have local presence or promote events on your Facebook page when you know what events, concerts, festivals and parades are happening in Montreal. Keeping up with local community calendars is an easy and convenient if you know where to search. Go-Montreal.comhas complete listings of all Montreal festivals and events happening during the year. Whether you are looking for music festivals or light festivals, you can find it on Go-Montreal.com. 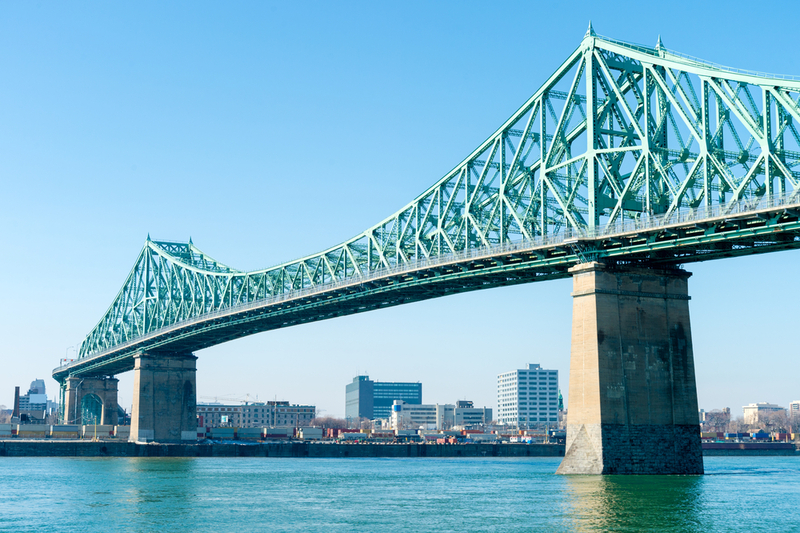 Montreal Tourism has all types of events and goings-on in the greater Montreal area including arts festivals, nightlife, family events, exhibitions and more. The official city of Montreal’s event page gives you everything going on in Montreal ranging from sporting events, arts and cultural festivities, parades and even more. EventBriteis an extremely useful website for any events all over. Using their search tools, you can find large, citywide events or smaller, personal events on this handy website. You can search Facebook’s event page feature to find all of the upcoming posted events in your network using this link https://www.facebook.com/events/upcoming Watching out for events and keeping an eye out for upcoming opportunities does not need to be an all day activity but you can stay in-the-know by checking the calendars on a weekly basis and adding big or relevant events in your calendar should help you maintain your social media. Are you out and about? It’s not necessary to be at every event in Montreal but if you do have a booth or a presence there, invite your Facebook fans to come out and meet you! Promoting sales, contests or giveaways you’re hosting at events is a great way to connect your online presence with your offline store and to support your town. If you’re not attending event, don’t let it stop you from sharing the event with your Facebook followers as a sign of support for the local community. This is the last step before you head into the social media world. It’s time take the necessary step of creating a plan. At first glance, social media looks like a laid-back place but it’s more than just a social playground. Facebook can be an effective and important business, marketing and sales tool when you know how to use it. You can make a name for your brand, grow your audience, increase your profits all on social media. If you want to take advantage of everything Facebook can give your business, you need to develop a plan. The first part of your social media plan is an overall goal, impacting how you utilize the techniques, tools and strategies you have learned in this guide. For example, if you want to spread your awareness for your business, your Facebook campaigns need to be aimed toward this goal and should focusing on widening your audience and reaching more people in your target market. riving every aspect of how you approach the tools and techniques at your fingertips. Don’t sign up for a page without going in with a clear goal. Once you have your goal, no matter if it is increased sales or a larger audience, you can start to implement what you have learned throughout this guide by creating your audience, writing your content, engaging with your audience and running advertising campaigns. You are ready to get your social media marketing efforts off the ground now that you have a clear understanding of social media. It’s time to start your path toward digital success. Kicking off your Facebook marketing can feel like an uphill climb in the beginning but it is an effort that will pay off in the end. Advertising and marketing your business on social media is one of the most powerful marketing tactics you can use. 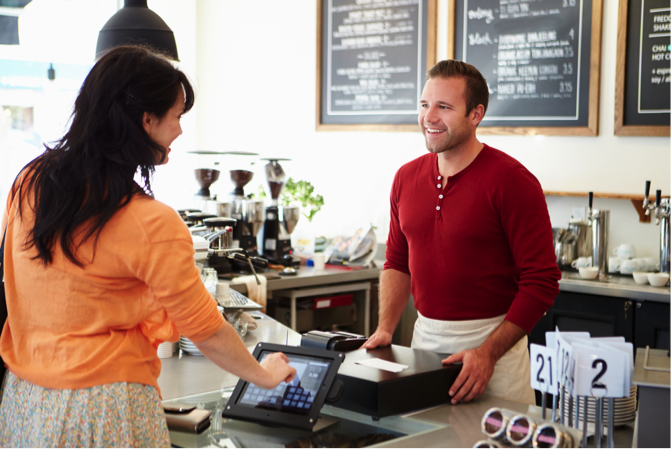 Social media gives small businesses a cost-effective way to get excellent results. Social media marketing offers great return on investment and easy to use tools so that even the least tech savvy individuals can achieve success and reach Montreal fan bases. If you are not up to the social media task, there’s no need to manage it all on your own. Partnering with a firm like Ensuite Media can give you the step up you may need in the digital world so that you can utilize the tools and create effective campaigns and grow your business on social media. Armed with a clear plan, an overall goal and the right insights, you can help your Montreal based company reach new customers, increase traffic and grow your business.